With the Federal election widely expected to be approximately 5 weeks away, the 2019/2020 Federal Budget is an electioneering budget, aimed favourably at individuals who vote. It is, if nothing else, predictable and not quite as “surprise-filled” as Treasurer Frydenberg suggested. We have been peppered with leaks on the greater-than-expected tax revenue collections this year (thanks to rising commodity prices lifting the tax and royalty take from coal and iron ore exports), which are helping fund many of the tax breaks and expenditure proposals. So, it is no surprise that the Budget is forecast to be in surplus for the first time in 12 years (albeit just 0.4% of gross domestic product or $7.1 billion). The Government also forecasts surpluses for the next 9 years (see chart below), although some commentators have already suggested this surplus may disappear by this time next year as the economy weakens. Guaranteed essential services such as Medicare, schools, hospitals and roads (also part of infrastructure spending). With the Opposition’s response on Thursday, one would expect that many of these measures will be matched, and possibly exceeded. Whatever advantage the Government may have thought it was getting by using the Budget as its election campaign launch is likely to be neutralised in 2 days. But leaving politics aside, one wonders about the merits of a Budget that delivers beer and skittles to the humble voter today at the risk to future generations of citizens from a budget that has only returned to surplus due to temporary circumstances outside the control of the Government (despite its brave forecasting for the next 9 years). It is telling that Government debt continues to rise until 2021/2022, if the forecasts are reliable, before starting to fall, as shown in the following chart. However, those projections also suggest we will have repaid net debt of approximately $361 billion by 2029/2030. As with all things Budget related, only time will tell (and, in this case, only if the electorate allows the Government to follow through on its promises). In what appears to be a thinly veiled attempt to woo voters ahead of the looming election, the Government is providing tax relief in the form of tax cuts and tax offsets to low and middle income earners. The tax relief will cost $19.5 billion across the forward estimate through to 2022/2023, $13.8 billion of which was provided for in the mid-year economic and fiscal outlook update resulting in “only” $5.7 billion of further expenditure in the 2019/2020 Budget. The reduction in tax provided to individuals through the non-refundable low and middle income tax offset (LMITO) will increase from a maximum amount of $530 to $1,080 per annum for the years from 2018/2019 through to 2021/2022. The reduction in tax provided to individuals through the non-refundable low income tax offset (LITO) will increase to $700 (from the currently legislated $645) from 2021/2022. The impact of these proposals is reflected in the following chart. The third change is that the upper limit of the personal income tax bracket subject to the 19% tax rate will be increased to $45,000 (from the currently legislated $41,000). The new tax rates and thresholds are shown in the table below (reflecting the three changes in this Budget described above as well as the changes from the previous Budget), with changes to the brackets shown in bold text. In addition to the above, the 32.5% marginal tax rate will be reduced to 30% and the 37% tax bracket will be abolished from 2024/2025. The abolishment of the 37% tax bracket has already been legislated. 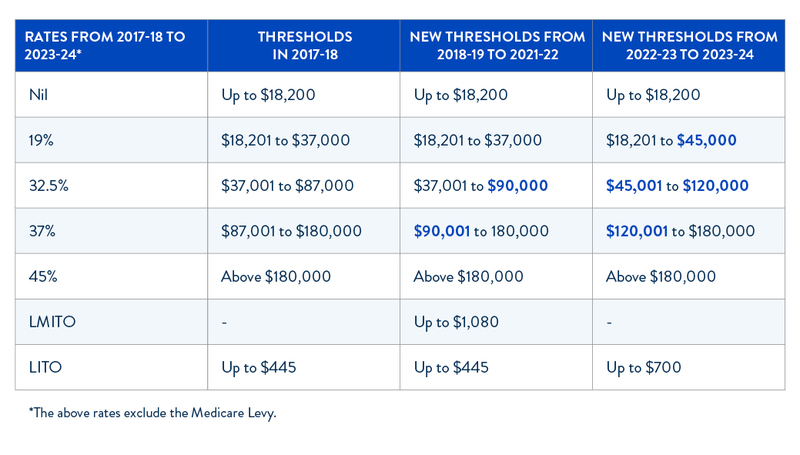 The Government will also increase the Medicare Levy low income thresholds from the 2018/2019 year as shown in the table below. The purpose of the Medicare Levy low income threshold is to generally exempt low income earners from paying the Medicare Levy. In addition, the family threshold is increased by $3,471 for each dependent child or student (instead of the previous $3,406). Although the voting public will generally happily receive a tax cut, there continues to be a lack of leadership on tax reform. There have been attempts to reduce the corporate tax rate with an increase in consumption tax rates, but all we have is an unnecessarily complicated two-tier corporate income tax rate system, one for certain companies with turnover of less than $50 million and another for those with turnover of $50 million or more. When one considers our growing ageing population (with increased welfare and infrastructure needs), there are growing expenditures on the horizon which need to be planned for. For example, $20 billion of revenue from fewer people in the workforce and $16 billion in welfare and aged care payments combine for a $36 billion cost over the next 10 years. We fear that shiny vote winning distractions are being tossed around without a steady eye on the future. Further, the changes to personal tax rates in this Budget are relatively small – much of the major work had already been done in the previous Budget. Apart from some tinkering, the 2019/2020 Budget is retelling the story of tax cuts already announced and legislated from the 2018/2019 Budget. Cynics would again point to the forthcoming election. make up to three years of non-concessional contributions, which are currently capped at $100,000 per year, to their superannuation account in one year. In addition, couples will also benefit as the spousal contribution age limit will be lifted from 69 to 74. Agreeing to amendments to previously announced Budget measures on inactive accounts. These include changes to when an account is considered inactive to 16 months of no contributions, expanding the definition of when an account is considered active and requiring the ATO to consolidate inactive accounts within 28 days where possible. The start date with respect to an “opt in” framework for insurance arrangements for members aged under 25 and accounts of less than $6,000 will be delayed to 1 October 2019. From 1 July 2020, reporting requirements will be simplified by allowing superannuation fund trustees with interests in both the accumulation and retirement phases to choose their preferred method of calculating exempt current pension income. For what some allege passes for the Government’s energy policy, the Government has announced a one-off energy supplement (which is not truly one-off since it was also handed out in the 2017/2018 Budget) of $75 for single pensioners and $125 for pensioners who are couples. The total cost of the announcement is $284 million, arguably providing little stimulus to the economy. The Opposition is not expected to block this measure. As predicted, no changes to corporate income tax rates have been announced in the current Budget. Companies do not vote, after all, but to be fair to the Government, the Opposition has already strongly signaled its position on company tax rates. In a measure supporting small and medium sized businesses, the Government has proposed an extension and expansion of the (once temporary) $20,000 asset write off which was first introduced in the 2015/2016 Budget. The threshold will be lifted to $30,000 (more than the $25,000 announced by the Government in early 2019), and this applies on a per asset basis. Medium sized businesses (with aggregated annual turnover of at least $10 million and less than $50 million), who were not previously eligible, will now have access to the instant asset write-off. The Opposition is not expected to block this measure given it has announced the Australian Investment Guarantee, which provides a 20% write-off on all new investments in eligible assets. The Government has announced that it will provide an extra $60 million in funding over 3 years under the export market development grants (EMDG) scheme for businesses with a turnover of less than $50 million to spend on overseas marketing and promotion activities, including on attending trade shows and on global platforms such as Google and Instagram. Many would argue this is a token amount – contrast the $60 million against the $3.8 billion in exports generated by the 3,500 business that accessed the EMDG last year. There is also some irony in that the Government, through the ATO and recently introduced avoidance measures, targeted some of these international platforms for avoiding tax in Australia, and is now effectively providing them with revenue through the EMDG. The hybrid mismatch rules apply to income years commencing on or after 1 January 2019. Please see our article for a summary of how the rules apply. Limited detail is available, but the amendments will clarify how the hybrid mismatch rules apply to trusts and multiple entry consolidated groups and limit the meaning of “foreign tax”. Also, the scope of the integrity measure in Subdivision 832-J will be broadened by specifying that the integrity measure can apply where other provisions have applied. The amendments will apply from 1 January 2019, except for the amendment in relation to the integrity measure which will apply from income years ending on or after 2 April 2019. Whilst we acknowledge the complexity of the rules, any taxpayers impacted by these amendments may be disappointed that the need for the amendments was not identified in the drafting and consultation stages such that they could have been planned for, noting that there was no grandfathering of existing arrangements. The existing list of 114 EOI countries will be expanded to include Curacao, Lebanon, Nauru, Pakistan, Panama, Peru, Qatar and the United Arab Emirates. The updated list will be effective from 1 January 2020. Residents in EOI countries that invest in Australian MITs can be eligible for the concessional 15% withholding tax rate in respect of fund payments (or 10% in respect of MITs that are clean building MITs). Division 7A is an integrity rule that deems certain benefits provided by private companies to shareholders and their related entities to be dividends unless they are Division 7A compliant loans or subject to an exception. Changes to the provisions were flagged in the 2018/2019 Budget, following which Treasury released a consultation paper on the possible changes in October 2018. In light of the feedback received, the Government has postponed the start date of various Division 7A amendments previously announced from 1 July 2019 to 1 July 2020. Allowing taxpayers who have inadvertently breached the provisions to correct their arrangements without penalty under a self-correction mechanism. Given the complexity of this area of law and dramatic changes in the maximum term of secured loans, the deferral will allow additional time for further consultation on the Government’s implementation approach. Anticipating ongoing consolidation of superannuation funds and trustees, heightened by observations made by the Banking Royal Commission (BRC) and the Productivity Commission, the Government has proposed that the current tax relief for merging of superannuation funds (due to expire on 1 July 2020) will be made permanent so that tax is not an impediment to such mergers. This measure is to be commended and the Government would be well advised to consider a broader review of rollover provisions within the tax law. GST did not get a mention in this Budget – this continues the trend in last year’s Budget where no major GST measures were announced. The lack of GST measures is consistent with general expectations in the lead up to this Budget. This Budget did however contain the following indirect tax measures. The Government will provide further relief to primary producers and tourism operators by amending the luxury car tax (LCT) refund arrangements. For vehicles acquired on or after 1 July 2019, eligible primary producers and tourism operators will be able to apply for a refund of any LCT paid, up to a maximum of $10,000. Currently, primary producers and tourism operators may be eligible for a partial refund of the LCT paid on eligible four-wheel or all-wheel drive cars, up to a maximum refund of $3,000. The eligibility criteria and types of vehicles eligible for the current partial refund will remain unchanged under the new refund arrangements. In this regard, it is noted that the pre-Budget calls for the wholesale abolition of the 33% LCT was ignored in this Budget. Laos, Mauritius and Samoa will have extended access which will include construction and renovation relating to their current and future diplomatic missions and consular posts. Each of these measures will come into effect from a time to be specified by the Minister for Foreign Affairs, and will be reciprocal and reviewed periodically. A $3.5 billion Climate Solutions package to reduce emissions and energy bills, $2 billion of which will go to practical emission reduction activities, working with farmers and indigenous communities. Quadrupling the Urban Congestion Fund from $1 billion to $4 billion to support projects, improve traffic safety and flow and increase network efficiency for commuter and freight movements in major urban areas. $3.5 billion for the first stage of the Western Sydney North South Rail Link. $2.2 billion from 2019/2020 to improve local road safety and provide upgrades across local road networks. $2 billion for a Melbourne to Geelong fast rail, which the Government says will “slash” travel times in half. Other fast rail corridors including Sydney to Wollongong, Newcastle, Bathurst Orange and Parkes are also planned. $465 million over 10 years from 2019/2020 to upgrade Australia’s Antarctic research station network and supporting infrastructure to enhance Australia’s environmental, economic, scientific, security and strategic interests in Antarctica. The chart below shows where the money is going. Off the back of the BRC and the hot button agenda item of the ethics and compliance practices of the “big end of town", the Budget smatters funding across a whole range of regulators. Further, the funding goes to expanding their remit and seeking to grow the returns they bring to the bottom line over the forward estimates. New regulators and accountability bodies have been established. We explored the tax angle to the BRC in our four part series. A broader discussion of the BRC can be found here. A key beneficiary of increased funding and powers to regulators in light of recent public controversies is the ATO. The Government will provide it $1 billion over four years to extend the operation of the Tax Avoidance Taskforce, its programs and its market coverage. The work of the Taskforce is centred on compliance activities targeting multinationals, large public and private groups, trusts and high wealth individuals. Increased funding is targeted at allowing the ATO to expand on these activities and increase scrutiny of tax advisors. In return, the measure is estimated to gain $4.6 billion over forward estimates. Additional funding is provided for the ATO aimed at recovering unpaid tax and superannuation liabilities and for the Treasury to conduct a communications campaign to improve the integrity of the Australian tax system. The Government maintains as an ongoing concern around activity in the black economy following measures in previous budgets and the Black Economy Taskforce Consultation Paper and Final Report (in 2017). This year’s Budget introduces a measure, commencing 1 July 2021, seeking to strengthen the ABN system by requiring ABN holders to lodge their income tax return to retain their ABN. Further, from 1 July 2022, ABN holders will have to confirm the accuracy of their details on the ABN register each year. The measure is estimated to have a gain of $22.2 million in fiscal balance terms over the forward estimates. The Government will provide a further $28.4 million over four years to AUSTRAC and the Fintel Alliance. The latter is a public-private partnership that targets the black economy, protects the financial system, disrupts money-laundering, terrorism financing and other serious crime.